Men have tried for generations to distinguish themselves with facial hair, from Abe Lincoln's iconic beard in the mid-19th century, to Wilford Brimley's iconic mustache, also in the mid-19th century. For a clothing company doing the same, check out Fuzzy Ink. 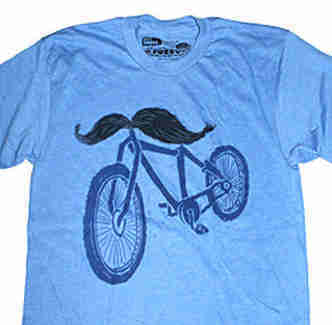 Run by three enterprising gents woefully unable to make their own upper lips hip (including a DC-born, graphic design-trained "Creative Director"), Fuzzy cranks out cartooned casual gear that's exclusively whisker-centric, a rigidly-enforced guideline they follow to avoid becoming "a t-shirt company that's just a bunch of random designs", which would just be totally, completely, silly. A slew of just-dropped "summery" tee designs include a fully bearded mountain man riding a squirrel, a frowning (mustached!) sasquatch with arm floaties/rubber duck inner-tube, and one with two pistol-dueling "spies" rocking handlebars, presumably to save them money when buying just the fake glasses/nose part of the disguises. 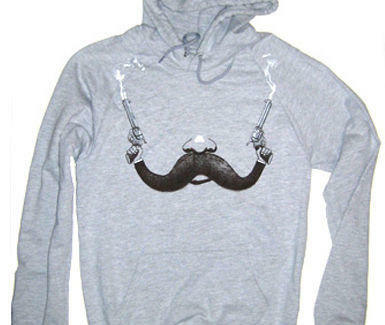 Slightly older classics include "Look Ma No Hands" (a faceless 'stache riding a bike), and "By the Stache of Zeus", featuring the white-bearded god toying with a brown lip-wig'd bolt, as well as designs also available on "100% combed mustache" (actually, cotton) hoodies, like the simple-but-elegant "Handlebar Hold Up", with the 'bar itself holding two smoking guns -- irrefutable evidence, if the crime is wearing a hilarious mustache sweatshirt. Non tee/hoodie action includes canvas belts like the mustachioed pirate "Landlubber Lars", and a surprisingly stylish, not-really-lip-coif-related charcoal/olive "Fidel Hat" that's "clinically proven to regrow hair", although if you're really that desperate, things are clearly looking pretty Brim.